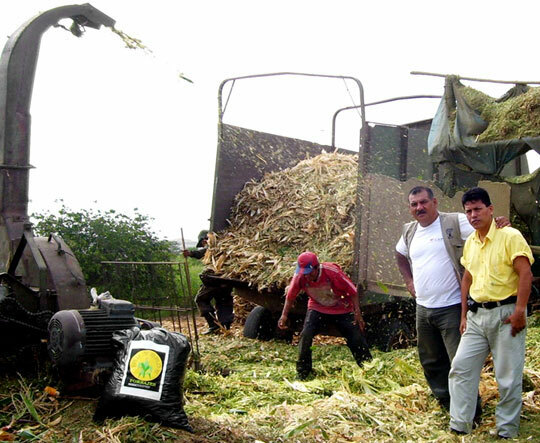 The founders of Forrajes Oro Verde recognized that both small-scale producers of the crops used for feed and the small cattle farmers they supplied were suffering from the ups and downs of the local fodder market in the Jequetepeque Valley of Peru. Falling prices from fodder surpluses prompted farmers to discard their excess. Scarcities, on the other hand, had cattle farmers foraging fodder from inferior crops or assuming higher costs to bring it in from afar. Jacob Tejada, Juan Guzmán and José Mendoza had a solution. They formulated an idea to package chala (fodder made from maize) and super-chala (with added nutrients) in long-lasting bags, which preserve the value of farmers’ crops and provide cattle farmers with affordable fodder. Seeking improved structure for their business and financing for a plant, they entered a Peruvian business plan competition run in 2008. Through participation in the competition and advice from a business consultant, their idea materialized into a business plan of the highest quality, and Forrajes Oro Verde won $15,000 in seed capital. The company has also secured more than $40,000 in loans. In 2009, the first pilot plant opened with the capacity to supply 26 tons of bagged fodder per day to the local market. Forrajes Oro Verde projects installing similar plants in nearby locations throughout 2010 and 2011, before expanding throughout Peru’s north coast through 2013.